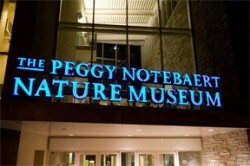 The Peggy Notebaert Nature Museum is prepared for an invasion of fleas, ticks, mosquitoes, tapeworms, and bed bugs this fall –all in the spirit of connecting guests with the science that unfolds in our own bodies. The museum’s newest exhibition, Eww! What’s Eating You?, explores the history of our closest companions –the parasites that live inside us –and uncovers detail of their mysterious and microscopic world. Visitors will never think of parasites the same way again. The exhibition opens Saturday, Oct. 22. For more information, visit www.naturemuseum.org or call 773-755-5100.